Yesterday was not a good day. Bad in multiple ways. Today is Moving Day. The truck is on it's way. So instead of continuing the frenzy, I decided to start the day with some centering time. While I was reading, this beautiful old hymn started playing in my head. I thought I'd share it, just in case anyone else is in need of a little soul-stillness this morning. Better yet, google it and listen. I was given a little parable this morning. Before I even picked up The Book. Someone must know I’m in a big hurry today. As we’ve previously determined, I have a hard time with transitions. My farewell rituals include taking pictures of whatever it is I’m leaving behind. So in the middle of frantic packing, I find the camera and try to capture the view from my bedroom window. Kim, you focus too much on the screen that separates you from reality. Look beyond the screen of your circumstances to the reality that is eternal. The reality is more beautiful than you can even begin to imagine. Fix your eyes on the immortal invisible. It is more real than anything you think you see. One day, the screen of obscurity will dissolve like vapor, and only the true and beautiful and eternal will remain. Live there now. Please give me eyes that focus only on You. I’ve finally figured out why chic Urbanites wear basic black. It’s not just because they’re Too Cool…it’s because their closets are so small. 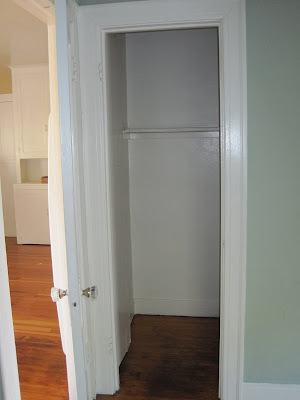 So now, even though the bulk of my wardrobe rests, unworn, on the East coast, I am still facing the dilemma of drastic down-sizing as I move from modern apartment to Munchkin-sized cottage. In fact, it actually could have been inhabited by Munchkins at one time. We’re moving from Westwood to Culver City, a part of L.A. where much of The Wizard of Oz was filmed in the 1930’s. Our new digs are just a block from the main drag, and were erected in the ‘20’s…so it’s entirely possible. Thinking that might have been the case gives it an aura of the exotic, and makes the 12-inch closet more acceptable. It would have been completely adequate for a Munchkin of the 1930’s. During the Depression, no one had that many clothes, anyway. We have too much of everything now. I made my way through the flooded streets of LA to measure. My new bedroom turns out to be just over 9 x 11. My husband probably won’t be able to fit into the bathroom. So, please just imagine the closet. And it doesn’t have a door, so I’ll have to stare at the mess from the bed. If the bed will even fit. The hail crashing on the windshield all the way back to Westwood was a fitting accompaniment to Mimi’s mood. Wagner was playing in my head. At least I had the roads pretty much to myself. Californians can’t drive in weather. Half of them just pulled over to the side of the road, politely allowing this native East Coaster to zip right past them. We’re used to rain. All of my wrecks have been in rain. Anyway, returning to the warmth of the apartment I’m beginning to really appreciate, I fix some tea and stand in the walk-in closet, surveying the challenge. How did I let myself get into this predicament again? Getting dressed is much more complicated these days. Stores are unfriendly. It used to be so simple…as a teenager, I’d walk into Heery’s Clothes Closet and helpful salesladies or the cool college girls who worked there would bring you the Villager skirt, blouse, and sweater that all WENT TOGETHER. And a pair of Pappagallo shoes to match. It was a no-brainer. Now, it’s like rocket science. This kind of top can’t be tucked in. This kind has to be tucked in. These jeans show the benefits of age spilling out over the top. Those make the rear view look as wide as Nebraska. The shirt’s supposed to hang out under the jacket. Leggings? At my age? I can stand in the closet for half an hour just trying to figure out what works. What will most effectively hide the flaws? The irony is that, with clothes crammed in so tight I can hardly see, I end up just wearing the same thing day after day. When you find something that works, you stick with it. I’ve been known to pick it up off the floor and put it back on in the morning. That way, you don’t even have to expend the energy of hanging it up. Okay, I’ve stalled long enough. It’s time to face the beast. It’s time to admit that, no, Kim, it’s not likely that will ever fit again. Quit saving it until you 'lose some weight.' That one looks like something your daughter would wear. Give it up. Put it in the bag. It’s not like you’re lighting a match to it. You’re just sharing…giving someone else a chance to enjoy it. Repeat: Less is more. Less is more. As I contemplate the effects of my conspicuous consumption, I remember a precious little book I read long ago called My Heart, Christ’s Home. It spoke of a man receiving Christ as a visitor. He was just fine with allowing him in the front parlor, but when Jesus suggested a tour upstairs, the man balked. When Jesus started to open the door to the closet, he freaked. I would, too. I wonder what clutter lurks in the closets of my heart. Are there still tight belts of unforgiveness? Designer bags full of unfulfilled needs? Elaborate costumes designed to cloak insecurities? Shoes dirty from going places I shouldn’t go? Dear Lord, please help me clean out all my closets. Forgive me for holding on to things I need to let go of. Enable me to embrace the freedom of simplicity. Does anyone else share these struggles? If so, I'd love to hear from you. My last weekend home was intense. Images of the suffering in Haiti haunted me day and night, impairing sleep. On Saturday morning, we attended the funeral of a young man whose hidden despair had caused him to end his brilliant life. That night, we went back to the same church, the church of my childhood, for the beautiful wedding of a bride of the same age. Life and Death juxtaposed in sharp outline. Joy and Grief. Celebration and Mourning. The last wedding I had attended in that church was Katherine’s. My husband and I were married there almost 33 years ago. In between the two events, I went to the annual gathering of some friends I’ve had for (literally) 50 years. The torrential downpour that raged on unabated throughout the day added atmospheric intensity to that of the internal. Exhausted, I fell asleep that night anticipating the peace that would surely envelop me like a warm cocoon the next morning at the sweet little church we currently attend. Three minutes into the sermon, a man collapsed in the aisle. With racing hearts, the congregation quietly cried and prayed as we waited for the ambulance to arrive. As the EMT’s lifted the man up, I allowed myself for the first time to picture the scene of my own child on a stretcher. The pastor came up to me afterwards and told me he was sorry we didn’t get to hear the sermon, as he had spoken of Katherine in it. I was sorry, too. That afternoon, I was frazzled as I packed. Too many last-minute things to do, not enough time or energy left for it. Sooooo many plans and projects left undone. Revelations over the weekend had given me fresh fodder for worry. Thoughts of what I would face back in LA gave me sick butterflies in my stomach. We had to get up at 5:00 to make the flight. I felt raw and edgy. I brought the weather west with me. The plane landed in a monsoon. It’s supposed to continue at least all week. Welcome back to sunny LA. The Sleep Monster and I spent the night wrestling. He won battles at 1:00, 2:30, 3:15. When my Iphone illuminated 4-something, I tried some contemplative prayer. Still no peace. Squirrels in the head competed with the loud aches and pains crying out for attention. I have so many things to worry about that I’m worried I’ll forget some of them if I don’t keep worrying. Okay, so here I am, Lord, at 5-something in the morning. I feel like I’ve been run over by a Mac truck. Everything’s chaos. There are so many people I am desperately concerned about. My heart is heavy and flitting around at the same time. So many unknowns, uncertainties. So many things to fear. So much pain. And I brought the crappy weather with me. You know how I hate this kind of weather. I feel like I’m in Narnia, where it’s always winter and never Christmas. I open the drawer of the bedside table and rumble around for some nose spray. Instead, I find a book I’ve been searching for months, one I feared left behind in a seat pocket on a plane. It was given to me by a friend who has an eerie ability to say exactly what I need to hear exactly when I need to hear it. Like she’s got a private line upstairs. It is The Furious Longing of God, by one of my favorite saved sinners, Brennan Manning. The fig tree is forming it’s first figs and the blossoming vines give out their fragrance. Putting the book down, I try to pray again: Say something to me, God. Calm me down. Tell me everything’s gonna be okay. I drag myself up and fix coffee. Since I’m already feeling jagged and jittery, might as well intensify the feeling so it’ll burn itself out. Get back in bed with my coffee and start writing this, not knowing where it’s going, what the point is. Smack dab in the middle of urban Los Angeles, a block and a half from the skyscrapers on Wilshire Boulevard, in the still moments just before dawn…a turtledove coos it’s lovely love song three times.